RG Herald: Local Rep. Urges Moves that Could Make Insurance Companies "Provide Rebates"
Local Rep. Urges Moves that Could Make Insurance Companies "Provide Rebates"
AUSTIN — State Representative Ryan Guillen (D-Starr County), joined by 30 other Texas House Democrats, urged Texas Department of Insurance (TDI) Commissioner Eleanor Kitzman to withdraw an effort that would cost Texas policy holders an estimated $260 million. TDI recently submitted an application to the U.S. Department of Health and Human Services (USHSS) to delay implementation of the Medical Loss Ratio (MLR) rule. The MLR rule is a provision of the Affordable Healthcare Act that would require insurance companies to spend at least 80 percent of policy premium dollars on actual medical expenses, rather than in-house overhead, marketing, advertising, or bonuses. Under the MLR, if insurers fail to comply with these standards, they must provide rebates to policyholders. In Texas, rebates would amount to approximately $350 for each policy holder. "I see no reason why the State of Texas would want to delay a measure that would save our citizens money. 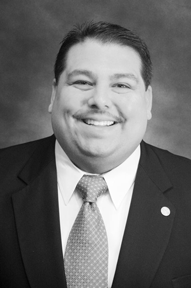 After a session in which the legislative majority slashed funding for essential public health services, South Texans need all the help they can get to cover their medical expenses," stated Rep. Guillen. "I greatly encourage South Texans to contact TDI Commissioner Kitzman, at (512) 463-6464, and persuade her to withdraw her application to delay the MLR rule." To date, the U.S. Department of Health and Human Services has denied MLR rule delay applications from Indiana and Louisiana.